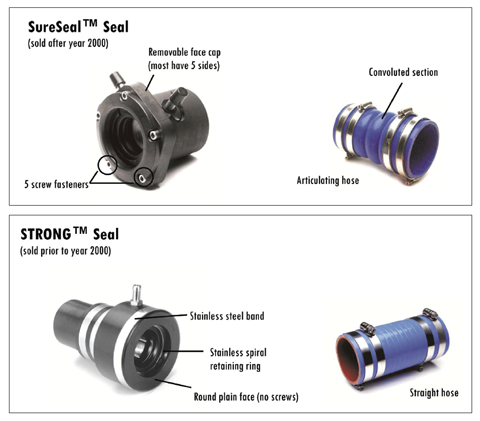 When ordering a spare seal carrier, you must first determine if you have a SureSeal® or a StrongSeal® (last produced in 2000). Please note the insets at right. The lip seals for some shaft sizes are NOT interchangeable. Identify your propeller shaft diameter in column A of each chart. Next, move to column B for this shaft diameter and confirm that there is at least this much clean, smooth space on the shaft to position the spare seal carrier(s). CAUTION: The spare seal carriers SHOULD NOT TOUCH THE SureSeal. The spare seal carriers should be located on the shaft at least 1" from the SureSeal housing.